The Connection Tab is the most important Tab in X-Config. This tab allows a user to create edit and launch connections to remote hosts. Click on the Manual button to Manually create a new Connection. All information is left blank for the user to fill in himself. Descriptions of the connection Properties can be found in each Connection Type’s respective chapter. In the Connections Tab, right click on an already created connection to bring up the menu. The menu option Clone will give submenus for Manual and Wizard. 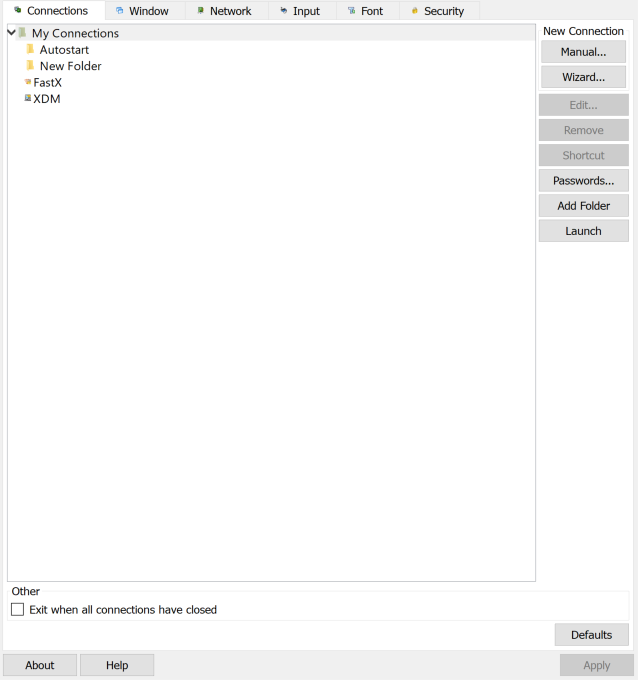 Selecting a submenu item will bring up the Manual or Wizard connection method with the connection options prefilled which the user can change as needed. After you have launched the connection, X-Win32 will attempt to connect to your remote host. If an error occurs, the error will be displayed in the Status Dialog box. Connections placed in the Autostart folder under My Connections will automatically be launched when X-Win32 starts up. This makes it very convenient to quickly connect to your remote system. .xw32 files have file associations with X-Win32. Double clicking on a .xw32 file will cause X-Win32 to automatically launch the Connection. A user can create a shortcut to the file in X-Config by highlighting the Connection and clicking the Shortcut button in the Connections tab. Double clicking on the created shortcut will launch the connection. Once a new Connection has been made, a user can edit the Connection Properties by highlighting the Connection and pressing the Edit button, by right-clicking on the Connection and selecting Edit or by double clicking on the Connection. A dialog box will appear with all the Connection settings which can be changed as needed. Note that these settings can only be changed if the user has write permission on the directory where the Connections are stored. Connections are stored in .xw32 files on the user’s system. Connections can be removed by highlighting the connection and pressing the Remove button, or by right-clicking on the connection and selecting the Remove item. A user can also delete the .xw32 file from the system to remove the Connection. .xw32 files store the Connection options and can be stored in any directory on your system. Click on the Add Folder button to add a new path. The Name field is the name that will be displayed in X-Config and in the system tray. The location is the path to the specified directory. Use this option to centrally locate Connections for multiple users on a system or in a domain. The Password Manager allows a user to quickly change the passwords of multiple Connections. This is an important feature if you connect to multiple servers and your password changes often (for example expiring passwords). Click on the Passwords button in the Connection Tab to Launch the Password Manager. the text in this field. After you have selected your Connections, press the Clear button to erase the Passwords from the system. The Connection will now launch with no Password stored. The user will be prompted to enter in the password after the connection has been launched. Automatically shut down X-Win32 when there are no more active connections.